D.I.Y. 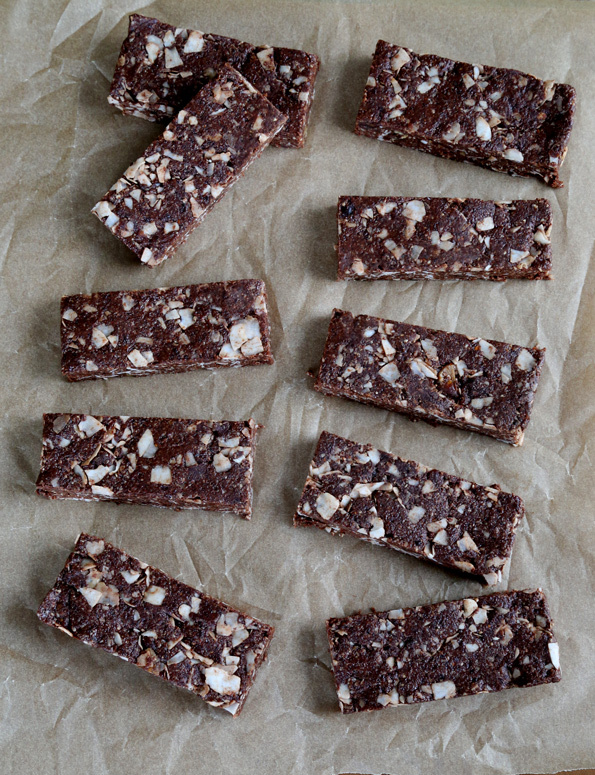 Friday: Chocolate Coconut Chew LARABAR Copycat | Great gluten free recipes for every occasion. These bars are so incredibly easy, and to be honest when I first made them I was really just looking for some more no-bake granola bars to stash away for my kids’ breakfasts. I wasn’t even *gasp* trying to develop a blog or cookbook recipe. Imagine that! When they came out so perfect, I made them again and again because clearly I was on to something—and I had to share it with you. 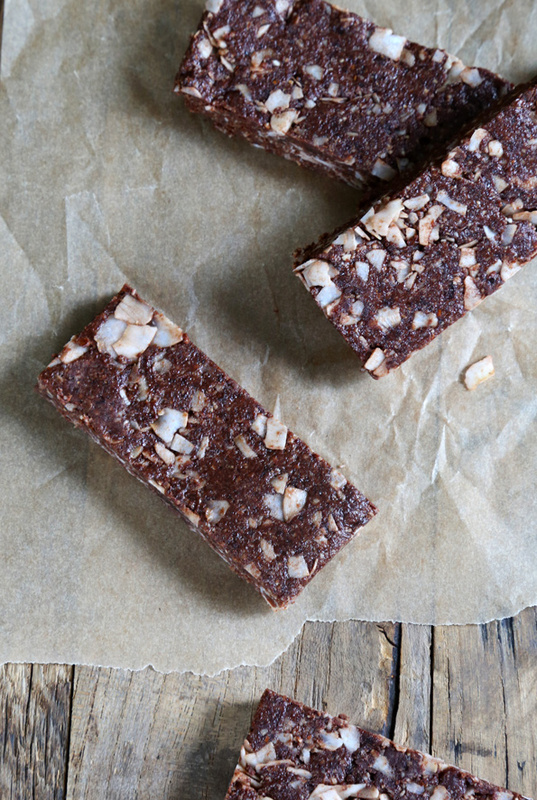 First, since they have no oats and no refined sugars and stuff, I figured I’d bill them as “Paleo Granola Bars.” But then … I realized that they were actually a chocolate coconut chew LARABAR copycat. When I was developing recipes for my next cookbook, Gluten Free Classic Snacks, I planned on a few LARABAR copycat recipes. Since it never happened, you’ve got them here instead! The LARABARs themselves are made with unsweetened cocoa powder, not melted unsweetened chocolate like these, their namesake copycat bars. But I find that it’s much easier to make these with melted chocolate since it really helps hold the bars together. And if they don’t actually hold together, they’re not bars. Amiright? Look how few ingredients! You do need to make them in a food processor, though. You could replace the whole blanched almonds with an equal amount, by weight, of blanched almond flour, but there’s still the matter of the dates and processing those. If anyone has any creative ideas on how to avoid the processor for the dates, let us know in the comments! I really like the coconut chips to be more lightly processed, since they give the bars some interesting texture—not to mention making them prettier. When you’re dealing with dark brown bars, some visual interest is a very.good.thing. Line an 8-inch square baking pan with two criss-crossed sheets of unbleached parchment paper, making sure the paper overhangs the pan on all sides. Set the pan aside. In a food processor fitted with the steel blade, process the almonds on high speed until small crumbs form (about 20 seconds). Add the dates, melted coconut oil, melted chocolate and salt, and pulse about 4 times or until the mixture holds together well. Add the coconut flakes, and pulse quickly and briefly (at most, 2 times) until the flakes are about 1/4 their original size. Transfer the mixture to the prepared baking pan and press firmly into one even, compressed layer. Place the baking pan in the refrigerator to chill for at least 30 minutes or until firm. Once firm, remove the bars from the pan by the overhung parchment paper and place on a cutting board. Slice into 10 to 12 equal rectangles with a large, sharp knife. Wrap each bar individually in plastic wrap or wax paper, and store in the refrigerator until ready to serve. P.S. Did you know that Gluten Free Classic Snacks, my next cookbook, is available for preorder? We’ll talk about it more soon, but for now … look at that gorgeous cover! Can you guess what’s inside?? Wondering how these would be using figs rather than the dates. Texture wise, I’m thinking they’d be similar. Tastewise, they’d be like the filling of Fig Newtons maybe. Sometimes when I buy dates, they are a bit dried out. The make-your-own pancake mix from my second cookbook is basically GF Bisquick, Donia! I know I’ve been missing in comments for ages, but I haven’t forgotten you! I recently moved and crazy life stuff happened, ya know. Anyway, I’m still getting my weekly updates (love them!) and wanted to come back into the fold and chime in about these lovely looking bars which I plan to make ASAP. 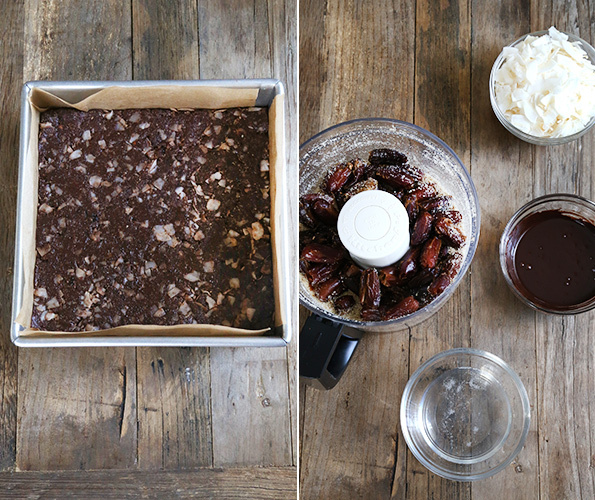 As far as I know you need a processor for dates (alas such a sticky clean up) but these bars look worth the effort! Interesting, Heather. I did one cookies-in-a-jar post, but it was ages and ages ago. Great suggestions! Do you have any recipes for Nutrigrain bars or Poptarts? We buy Glutino brand, but it really doesn’t come close. They are far from healthy food, but they work in a pinch. Or what about Totinos pizza rolls or egg rolls? I was going to try to make egg rolls with your wonton recipe. Hi, Angie, I have recipes for nutrigrain bars and Pop tarts already on the blog, and there will other (updated) versions in my next cookbook. Many of the things you asked for are actually already on the blog. Just use the search function! I just made some of these…they are amaaaazing!! PS I used a bar of Cacao and its sent me buzzing!!! Nicole, these are interesting! I have never heard of LARABARS…LOL! I’m a date fan so these are on the to do list. Suggestions? you seem to have plenty good ones already. Salad dressings are a GREAT idea, Brenda! I never, ever buy dressing since I got so sick of having a million different bottles half-finished in the refrigerator until they went bad. And the basic ingredients for all dressings are largely the same, so there’s really no reason to buy. I will most definitely do a DIY Friday on salad dressings—lots of ’em! Thanks! How about the Girl Scout Savannah’s? Everyone around here used to love them. Can’t wait for the new cookbook. Idea for not having to process dates: perhaps if you buy pressed dates (http://www.walmart.com/ip/Ziyad-Pitted-Baking-Dates-13-oz-Pack-of-6/31219879) they might be the right texture just to mix right in. Was at the grocery store yesterday and looking at slice and bake cookies that form pictures. Weird, maybe? But they have an appeal, I’ll admit. Is it possible to add in nutritional info on thee wonderful remakes? I try to watch calories, fat, protein and carbs. These look amazing, cannot wait to make, later today!! I don’t provide nutritional information on my recipes, Mary, as it’s just me here and I’m afraid I just don’t have the time. I wouldn’t be doing anything that you wouldn’t do though—just plug in the ingredients in one of the online calculators! I love the KIND nut bars so much – would love to see more of them. Also, like spiced or sugared nuts. béchamel sauce – other cheese sauces. freezer items. school lunches (I’m also doing the same old crud). I’ll think of more – give me time. A DIY taco seasoning or other similar seasonings would be great. How dissapointing is it to take home a packet of that stuff only to realize it has gluten!? I mix up a few of my favorites and keep them in little jars, (because little jars are so cute they make me giggle every time I see them) and I’m ready to whip up some tacos at the drop of a sombrero! I can’t eat chocolate, so I use carob powder. This is an easy subsitution when the original recipe calls for cocoa powder. Subsitutions are more complicated when subsituting for chocolate squares/chips. Do I need to add anything to this recipe to compensate for the differences? Sarah, as I mention in the post, I use melted unsweetened chocolate because it really holds the bars together. If you substitute carob powder you really are creating a different recipe, so I’m afraid you’ll have to experiment! Thanks, do you have any suggestions on a different carob Larabar recipe? If not, do you have any other Larabar type recipes that don’t call for chocolate? I would love a copycat recipe for the peanut butter chocolate chip Larabars! They are my fave, and I spend so much money on them, I’d love to know how to make them my self! I love the chocolate chip cookie dough Larabars. 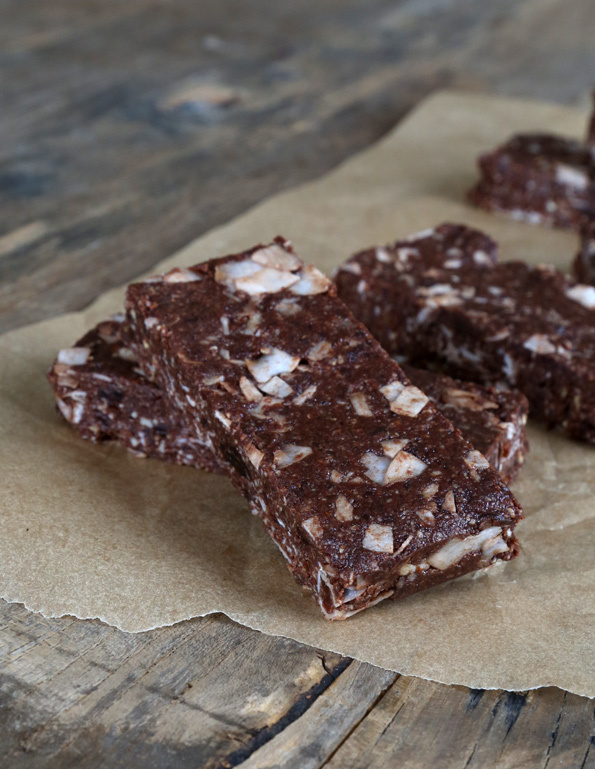 These coconut chocolate ones are my next to try. I love mounds bars, so I’m sure these will be awesome.